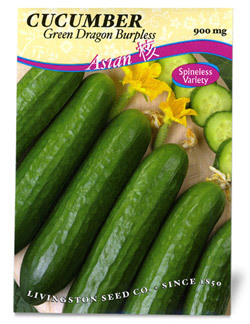 Green Dragon Burpless is a great tasting cucumber without any bitterness! A dark green, spineless variety. Ideal for salads and appetizers! Green Dragon is approximately 8-10"L and 1½"W. Very disease resistant. Garden Tip: Pick regularly so cucumbers will continue to form.